Spring break vacations are so predictable. Families flock to the beach. The big cities. Disney World. And while there’s nothing wrong with that, spring break can also be a great time to introduce the kids to a lifelong passion for the outdoors (hopefully). It’s cheap, it’s fun, and it can be really easy! Here are some tips. 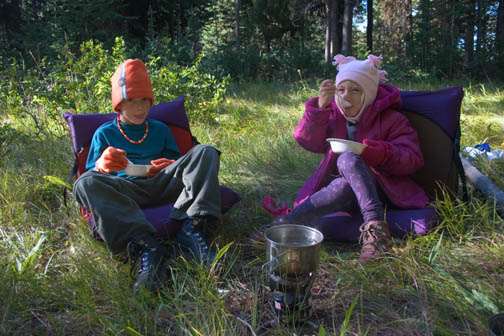 If your little one isn’t sold on the camping idea just yet, you can help ease them into it by choosing a campground that is fun and exciting from their perspective. Find one with a pool, miniature golf, playgrounds, easy hiking trails, or a petting zoo. There’s a heavy emphasis on car, here. With a vehicle at your disposal, you can afford to pack a few extra goodies for the trip. Air mattresses. String lights. Half their toy box. The kitchen sick. Just leave the electronics at home where they belong. Once you pick your campsite and get settled, round everyone up and set off in search of adventure. Go fairy hunting, rock collecting, bird watching, fossil finding, animal tracking, or flower identifying. Roasting marshmallows over an open flame is the most quintessential camping experience. Plus, it gives you an opportunity to talk about fire safety with the kiddos. Bonus—you can then all go on a late-night headlamp walk to work off some of that inevitable sugar rush! Being outdoors is fun and all, but at some point the kiddos will want to wind down and sit (relatively) still for a while. We hope. Pack a good variety of games for the family to enjoy, and good books to read later at night. And when all else fails, mom and dad can pull out the hidden iPad and queue up a movie. Or, worst case, pack the car up and drive on home. But that won’t be necessary.